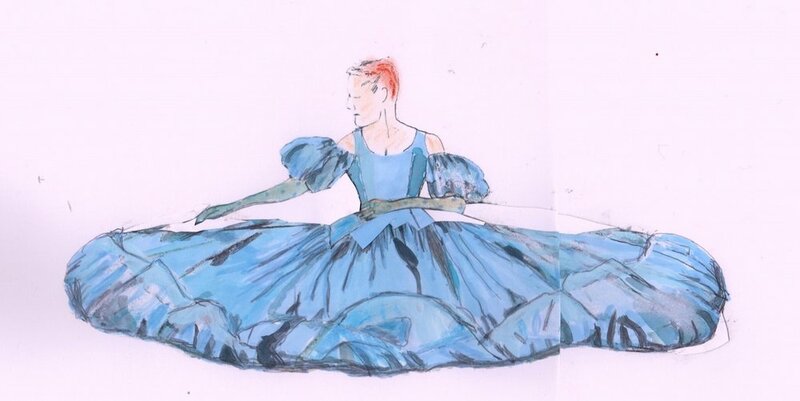 Costume sketch by Sonya Berlovitz. Over the last 37 years as a costume designer, my process has changed from beginnings of doing everything by hand. I am insatiably curious by nature and am always interested in new techniques that can enhance my work and process. Today I rely on a variety of tools to complete my work, some old school and some new school. When I was younger—a lot younger—I was a purist. I went to school in France to learn the labor-intensive hand technique of draping. I honed my drawing skills there as well. Being in Paris and working very slowly to develop my skills felt very romantic and, due to a very good currency exchange rate, was available to me. That year of study laid the groundwork for my working process. Throughout the 1980s and ’90s, I alternated between building a lot of the costumes I designed myself and supervising a team that worked alongside me to finish costumes. At that time, translating designs with my own hands was a very direct and natural way of working. In the early 2000s, I started designing shows out of town. Then the entire landscape transformed for me. Instead of building the costumes by myself, they were built in a shop; I was responsible for only the designs. I have to admit that it was clunky at first. I had to learn to communicate my designs to others to then translate them into realized designs. With practice, I thought of it as a gift to have someone more skilled than myself build my designs. Plus, I was able to spend more time on the details of any one costume and how it fit into the overall aesthetic of the production. Working out of town meant I was only on site sporadically. A good portion of communications with costume shops happened online. It was efficient and, since I wanted to continue to design on a national scale, a necessary and essential part of the work. Along with enabling long-distance design work, computer research exponentially increased my ability to find resources and inspirational materials. I have always loved libraries and sometimes I miss the days of scanning the stacks for books on whatever subject I am delving into. But I have to admit that being able to research any subject and have a wealth of information available via my keyboard is very handy for someone who gets up between 5 and 7 o’clock in the morning, before libraries are open. In 2007, Dropbox came along for file sharing and many places I worked, both in town and out, started to use it on a regular basis. It has been a very handy tool to quickly convey design research and concepts to other production staff and the director, as opposed to trying to organize a meeting with everyone at the table—which, with many freelancers involved, is no easy task. To some extent, I am nostalgic for days ago when everything was done by hand and, in some ways, simpler. I cherish those experiences and, when I have time, I still like to have hands on a project I can work very slowly with. That’s probably why, over the last several years, I have been collaging many of my renderings. I am grateful to my all-in-one printer for making the time intensive method that much easier and faster. We read a lot of book to and with our children. Angela Johnson’s books have long been a favourite in our household, with her wide range of subjects and narrative styles, ranging from Rain Feet (a very short poem) to Just Like Josh Gibson (a narrative story). We recently acquired When I Am Old With You, and it’s spectacular. A short story that explores the relationship between a child and their grandfather, aging, life and longing, the inevitability of death and the innocence of youth, it reads quickly and lyrically like most of her work. The art is beautifully wistful and the underlying themes are subtle and interesting and when they yield up their secrets the words will stick in your throat. While not all of Angela Johnson’s work is quite that impactful, a lot of it shines with her brilliance at taking serious and powerful themes and creating accessible, often whimsical stories around them.